The Strong Cities, Strong Communities Initiative (SC2) supports President Obama's agenda to make historic investments to build ladders of opportunity for those working hard to make it to the middle class and to partner with communities that were hardest-hit by the recent recession. In this column, Mark Linton, Executive Director of the Office of SC2 talks about recent developments in this initiative. 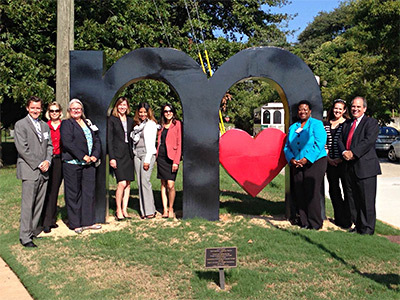 Members of the federal SC2 team gather for a work planning session with Mayor Robert Reichert (far right) in Macon, GA. Image courtesy of Chris Floore, Macon-Bibb Public Affairs. We know that a new group of SC2 Community Solutions Teams have begun their work recently. What can you tell us about the new set of cities and the work of the teams so far? We had over 50 cities from around the country apply to participate in the Strong Cities, Strong Communities initiative. Out of those, seven cities were ultimately selected to receive a team. These teams work on the ground, they sit right alongside the mayor and the mayor’s staffs and they are comprised of experts from nearly every domestic agency in the federal government. We’ve called them Community Solutions Teams because they are there on the ground to focus on the needs and priorities of the mayor and the community, and to take a practical problem-solving approach to areas where the federal government can be most helpful in addressing their priorities. So, it is not only HUD staff who work on these teams, but staff from agencies, like EPA, DOT, SBA, the Department of Justice, and the Department of Commerce. We’ve expanded the initiative to seven new cities: Rockford, Illinois; Flint, Michigan; Gary, Indiana; Rocky Mount, North Carolina; Macon, Georgia; St. Louis; and Brownsville, Texas. What we are seeing so far in these places is that the progress we are making is being driven by the strength and quality of local partnerships. It underscores for us that strong partnerships cut across all sectors, including the public and private sector including our partners in business, philanthropy, universities, and nonprofits. Significant progress is possible when these partners come together around a set of goals. So in a place like Macon, we are focusing on ways that the federal government can be helpful in their efforts to revitalize their downtown, particularly along Second Street, and make sure that we are doing everything that we can as federal partners to provide advice, expertise, and support with particular strategies that the city is pursuing to redevelop that area. In Flint, we’re continuing to work with them around issues related to land use and economic development. We’re asking ourselves: how can we help the City execute its new master plan, Imagine Flint? The SC2 teams have only been on the ground for a few of months now, in most cases, but we are already seeing some great results and having significant impact. How about the new National Resource Network? What can you tell us about how it’s working? So far, the response has been tremendously positive. The National Resource Network is our effort to scale the model that we have tested through SC2 teams being on the ground. The National Resource Network is going to many additional communities that are regularly asking for this kind of more integrated technical assistance and problem solving support. The National Resource Network has already begun doing assessment work and partnering with local leaders in nine communities. It has also launched the first ever one-stop shop online for communities around the country wanting to access best practices and seek expertise – available at www.nationalresourcenetwork.org. And one of the neatest innovations that we are proud of is a 311 service for cities, in which cities can actually email and contact a live expert and they will get a tailored response within two business days with an offer of follow-up support or additional coaching, if that is needed. How important has program evaluation been to the work of the initiative? It has been a cornerstone of what we have done so far. In fact, there will be findings issued in the near future based on an evaluation of the team deployments in the first round of SC2 cities. In addition, building in an evaluation component is going to be a core element of how the National Resource Network will engage on the ground. Consortium members include: Enterprise Community Partners, Public Financial Management, HR&A advisors, International City County Management Association, and NYU’s Wagner School. NYU is also working with the Urban Institute on the evaluation work around this project. As the resource network teams go out and work in communities, they will be assessing that impact with carefully tailored research criteria. What has been your favorite memory so far of your time as the Director of the White House Council on Strong Cities, Strong Communities? It is hard to pick one. I would say that my favorite memories have been the times when we have been able to help a community achieve a breakthrough on a tough issue or challenge that they have been facing, and make some real progress. One great memory for me is when we were able to help make sure that Mayor Landrieu could break ground on a major infrastructure project that involved braiding HUD dollars and DOT highway dollars in a way that had not been tested before anywhere else in the country. Or when we were able to help the city of Detroit launch an innovative public safety and transit service by allowing people, especially students, to send a text and get live updates on the bus schedule so that kids could get to school on time and could also get off of dangerous street corners – that was a great memory for me. So it has been when we were able to help these places make real progress in matters that affect the lives of their residents in a way that is going to have a lasting impact. What do you think will be the lasting impact of SC2? Given the approach that we have taken with the initiative and that we are really trying to address an interconnected set of opportunities and challenges that a lot of communities face, I think that our lasting effect is going to be two-fold. First, I think that we are going to see an impact on the ground in places where we have done work. They are going to see positive benefit and real results in support of their economic turnaround strategies, which typically have a long tail, so we may not see it for a while still. I think that when we look back in places like Fresno or Memphis or New Orleans, there will be an inflection point in the history of their economic development, and SC2 will have played an important role in creating more opportunity during our time being on the ground. Second, across the federal government, one lasting effect of this initiative is that we have demonstrated that there is a way to model a new Federalism, where we take a place-conscious approach in how we deliver federal programs and execute on policies that are driven and guided by local priorities. In the past, the federal approach has been too often siloed and rigid and top-down. Through SC2, the federal government is saying that we are going to really make sure that local priorities and visions are driving the work, and we are going to be there to play a supportive role. For our part we are going to work more cohesively as federal partners across our historic boundaries and silos because it takes everyone working in the same direction to see the kind of results that we know these communities are trying to realize. I think that is going to be a real legacy in the federal government because a lot of these communities, after having had the experience of working with SC2, have been very clear that they do not want to go back to how it used to be, to business as usual. More and more places are demanding this more integrated, holistic kind of support and advice. Part of it is that it is just good government and it makes good common sense. Ultimately, we are also going to make better use of our taxpayer dollars by taking this approach. Our technical assistance just in our first seven communities helped these places more effectively invest over a third of a billion dollars in existing federal money through problem solving, innovative solutions, and technical advice and that is a great benefit to taxpayers.